This page serves to make publicly available the products of the SANBI Marine Programme. Products listed below are available for download. The SeaKeys project is a large, collaborative three year marine research project (2013-2016) funded by the National Research Foundation through the Foundational Biodiversity Information Programme. The project aims to collate, increase and disseminate marine biodiversity information and support the application of this knowledge in monitoring, decision making and maintaining benefits from marine biodiversity for South Africans. In addressing the multiple objectives of the project, one aspect was to collate information about marine monitoring initiatives underway in South Africa’s exclusive economic zone. A SeaKeys monitoring workshop was held in November 2015. Participants were invited from several key national departments, institutions and organisations within South Africa that engage in some level of marine ecosystem and/or species monitoring. Participants were requested to represent long-term monitoring initiatives that are in existence or planned for in the near future within their organisation. A simplified metadata template was distributed prior to the workshop with the request that participants source the relevant information from their colleagues about each appropriate monitoring initiative and submit, with position information, prior to the workshop. The complete technical report is available on the BGIS website, but you can download the Executive Summary here. This report has refined the habitat map from the 2004 report (click here to download the map). 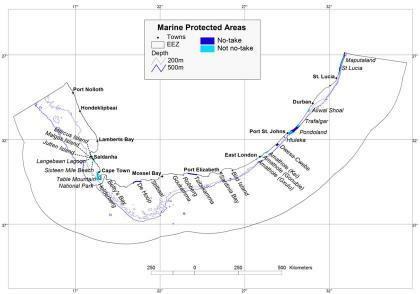 This report also included a map of marine protected areas for South Africa. Click on the image to download. The National Biodiversity Assessment (NBA) 2011 Marine and Coastal Component has also identified the Key Research Priorities for South Africa. Much of the data that was collated in this project was used to enhance the NBA. This project produced a report on Guidelines for Offshore Marine Protected Areas for South Africa. This project identified 10 priority areas for offshore protection – see image below. 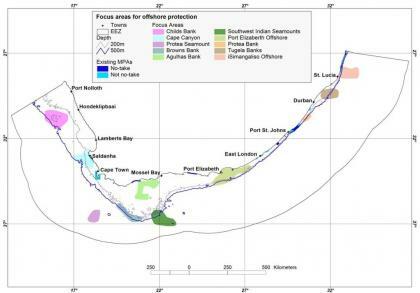 The summary report – Systematic planning to identify focus areas for offshore biodiversity protection in South Africa – is also available for download and provides information on the identification of the priority areas for offshore protection and/or management. SANBI has a history of collaboration with industry. The Marine Programme has successfully worked with PetroSA on assessing the role of petroleum infrastructure in offshore spatial management. The report from this collaboration is available here. The Marine Programme has also collaborated with the fishing industry by undertaking work to support the Hake Demersal Trawl Fishery sector in addressing conditions of its Marine Stewardship Council (MSC) certification. A report on the potential impacts of trawling, along with historical perspectives, was produced and is available here. For more information on the MSC please visit their website at www.msc.org. What is Climate Change Adaptation?